` Rates for swimming pool loans are at a decade low in most states and it may be time to revisit that swimming pool or backyard project. Did you know that both equity based loans and non-equity loans ( usually called unsecured pool loans) are both available in all 50 states for projects such as swimming pools, sunrooms, outdoor kitchens and other installed home improvement projects. At the time of this post it is currently late Fall and many pool builders, designers and contractors are just starting to catch their breath after a very long and busy pool season. Many pool builders and contractors are offering Fall and Winter pricing specials for the consumer who is savvy enough to take advantage of these specials. Now is the best time to talk to your pool contractors before the spring rush of customers and before many will consider raising prices if their cost increase. 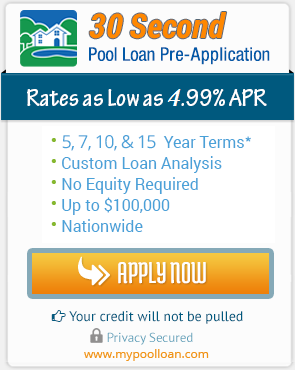 If you are serious about having a swimming pool open and ready to use by Memorial day this is the perfect time of year to take advantage of the great pool loan rates and pool contractor specials.